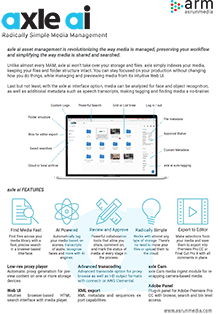 axle asset management is revolutionizing the way media is managed, preserving your workflow and simplifying the way media is shared and searched. Unlike almost every MAM, axle won't take over your storage and files. axle simply indexes your media, keeping your files and folder structure intact. You can stay focused on your production without changing how you do things. In a half hour, you can have the system up and running; in an afternoon, you can have it configured to meet your needs. The axle Gear appliance is a 2U rack mount server with Intel Xeon-based processing power, built for radically simple media management. The system integrates axle Video’s award-winning axle Gear software, with mirrored disks for OS boot and 8 disk bays for media storage and 10 Gigabit Ethernet connectivity for prompt access. automatic proxy generation for one or more storage devices (SAN, NAS or DAS). 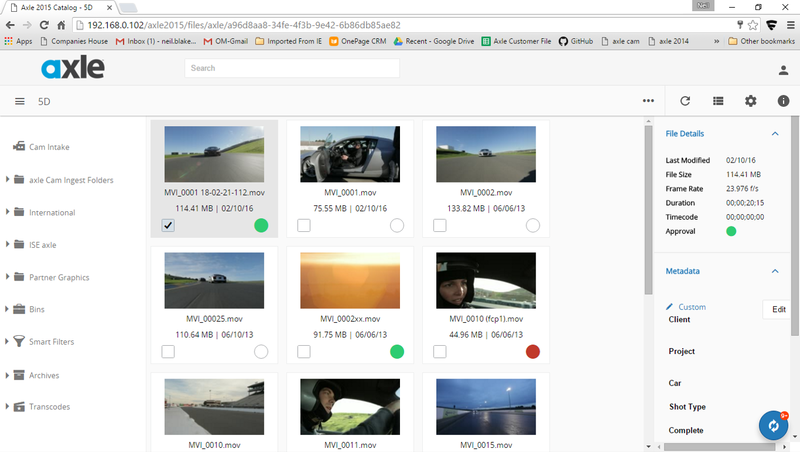 intuitive browser-based HTML5 search interface with playable H.264 previews. advanced transcode option for proxy browse files as well as HD output formats. 5 named user license – each user can have different access privileges and permissions. plug-in panel for Adobe Premiere Pro CC with browse, search and bin level access. axle Cam media ingest module for rewrapping camera-based media. XML metadata import and export capabilities. 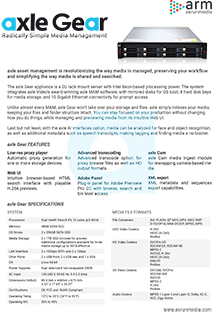 The integrated storage subsystem can be used to house either the low-res proxy media files generated by axle’s Gear software, or (in on-set applications) the high-res media files as well as low-res proxies. By default, axle Gear generates 1 Mbit/s MPEG4 H.264 proxies although a higher bitrate can be selected by the system administrator. axle Video professional services are available either remotely or onsite for system commissioning and training. Media Storage 2 x 1TB SSD mirrored for proxies. Additional configurations available for hi-res media storage up to 38TB effective.